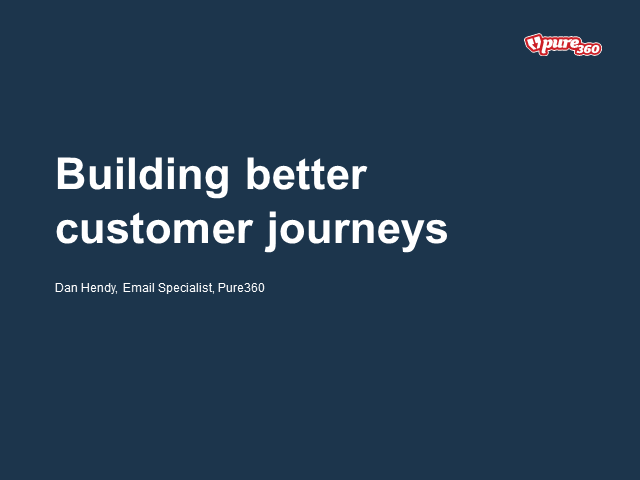 Join one of Pure360's resident email specialists, Dan Hendy, as he details how you can build better customer journeys, and how your business can benefit from doing so. Join our free webinar where we’ll be discussing the growing need for ecommerce brands to implement a personalisation and abandonment recovery strategy. With some hard hitting industry statistics, what the capabilities are of such solutions and real life examples of how these personalisation and abandonment recovery solutions can transform your ecommerce business. 44% of consumers say that they will likely become repeat buyers after a personalised shopping experience, now is the time to rethink your personalisation strategy. We’ll also showcase our PureTargeting solution, giving you the ins and outs of its powerful capabilities and features, how it works and the real ROI our solution offers our ecommerce customers. Book your place today and discover how personalisation and abandonment recovery solutions will offer your visitors a superior personalised experience, increase conversions, improve customer retention and show significant ROI in a short space of time after implementation. ‘Luke 1977 decreased abandonment rates by 17% and increased revenue from cart abandonment recovery by 60% using PureTargeting'. It’s almost here. The most wonderful time of the year for retailers: Black Friday and Cyber Monday. For many it can make or break an entire year. Yet many brands are still delivering the same generic Black Friday marketing. Year in. Year out. In this webinar we reveal the 10 Black Friday mistakes that brands make and how to avoid them. Watch the webinar. Avoid the mistakes. Make this Black Friday your best ever. We all know the benefits of personalisation for email marketing, yet many marketers are still struggling to advance beyond the basics. When used well, personalisation can have a transformative effect on not just an email marketing programme, but on your customer experience as a whole. And it goes without saying that personalisation generates amazing results. Research by Experian revealed that personalised emails deliver 6 times higher transaction rates. Earlier in the year Pure360 and Holistic Email Marketing surveyed marketers across a wide range of sectors to understand how email personalisation is being used today. In this webinar, we dive into the results and offer advice you can put into practice. From overcoming data issues through to creating seamless cross-channel experiences. No matter where you are on your journey, this webinar will guide you towards building a world-class personalisation strategy. We all know that generating maximum engagement from our email campaigns post-GDPR should be a priority, especially if your email lists have reduced in size. The busy email marketer is always thinking about the next campaign. But sometimes you need to take step back and look at what you’re currently sending. Is your design looking dated? Are your templates following best practice? Is your content as engaging as it could be? Watch our webinar to learn how to give your email creative a top-to-bottom audit. Learn the secrets behind attention grabbing emails that drive conversions. Take this opportunity to get inspired and rethink your email creative to keep your subscribers engaged. Studies show that it’s 25 x more expensive to acquire new customers than it is to retain existing ones. That’s a pretty impactful statement considering a large majority of marketers spend more time and budget on acquiring new customers instead! GDPR certainly hasn’t helped matters either with its impact on reduced customer email lists. So we’re hosting this webinar to showcase the key areas to focus on to keep your customers engaged, ensure they continue to buy from you and to increase your brand advocates. A month on from GDPR and marketers are facing the aftermath of the GDPR panic. Many still don’t know where they stand. Some brands are left with significantly less subscribers after choosing to run re-consent campaigns to their entire database. With less people to market to, their revenue is now taking the impact. This sounds like a nightmare but we’re here to explain that things aren’t all doom and gloom. There is opportunity in a post-GDPR world and this webinar will guide you through the steps you need to take to achieve success within your email marketing. It’s also worth remembering a reduced list size isn’t necessarily a bad thing. You’re now talking to your most engaged subscribers! GDPR is here. And email marketing will never be the same again! Or will it? Watch this on-demand webinar to learn what changes for email marketing and how we can prosper in a post-GDPR world. • How to ensure your subscribe forms are compliant and optimised for conversions. Learn from real-life examples of brands who are getting it right and practical advice on how you can ensure GDPR isn’t holding back your marketing. New research has revealed that £18 billion worth of products are left in online baskets every year. That’s a startling amount of revenue that retailers are just letting slip away. And the vast majority of brands aren’t doing anything to combat this. There are so many quick wins when it comes to tackling basket abandonment and we're going to show you what they are. Looking at an email subscribe form, you may think it takes very little effort to get it right. But this is an area where a lot of retailers are going wrong. • Practical ways to optimise your forms to increase conversion rates. Consumers are demanding that personalisation adds real value, and most brands aren’t delivering. That’s why 2018 is the time for marketers to rise to the challenge of creating better customer experiences - it’s time to take personalisation to the next level. Sign up to our latest webinar and learn how you can deliver next level personalisation. Can’t make it? No problem. Sign up anyway and we’ll send you the recording after. 88% of people say they’re more likely to shop from brands that deliver personalised cross-channel experiences. However many brands still don’t use personalisation on their website, let alone across multiple channels. Our platform changes that. We’re making cross-channel personalisation a reality for brands of all sizes. And the results speak for themselves. Our customers average 22% more online revenue. Join us for live product demo to learn how personalisation will transform your customer experience and drive more revenue. • Increase customer lifetime value with automated lifecycle campaigns. Can't make it? Sign-up anyway and we'll send you the recording after. GDPR is coming—25th May to be precise—and you've likely heard that it will result in big changes across your business. But you might not be entirely sure what it means for your marketing team. A lot of the information around GDPR can be complex and difficult to digest. To help you get prepared we've hosted a webinar to explain—in plain English—how GDPR will impact marketers. • Why GDPR is an opportunity for savvy marketers. With 2018 in full swing, there’s never been a better time to refresh your email strategy, and consider new tools to help you increase your efficiencies and improve your results. Our research shows that only 1% of organisations are using email to its full potential. We want to change that in 2018. • Easily report on your success. Join Senior Strategic Account Manager Tom Ricards to learn how you can utilise recovery email campaigns to recover lost revenue and increase online sales. Join Chantelle to learn why your relationship with subscribers and customers shouldn't stop at the sign-up or the sale, and how you can increase customer lifetime value using post conversion email campaigns. Special Guest Presenter Jenna Tiffany of Let'sTalk Strategy gives her top tips on how to get the most from retargeting and personalisation without being creepy! Discover how and why welcome campaigns are an important part of your email marketing strategy, and how best to use them. Learn how to generate the best leads from your email marketing campaigns with our ideas and suggestions around best practice lead generation. Lee takes a look at our recent Email Design Trends 2017 report and offers further insight into some of the key design trends for this year and beyond. Discover why you need to fully understand your data when you create and maintain your customer journeys for your digital marketing strategy. View our email and digital marketing webinars to learn how to transform your digital marketing results. Hear and learn from members of the Pure360 team, covering all aspects of digital marketing, including how you can increase open and click through rates, engagement, and ROI through email.